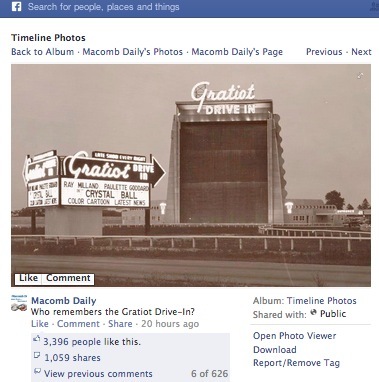 My Tuesday blog post about the value of archival photos for Facebook engagement caught the attention of Allen Klosowski, Digital First Media’s senior director, social media and mobile. I think the short, pithy questions that Maryanne MacLeod of the Macomb Daily uses with some of her archival photos (below) tend to get stronger engagement. But I also like the idea of inviting people to click for more old photos on your website. I’d like to see how it works if someone combines the two techniques. 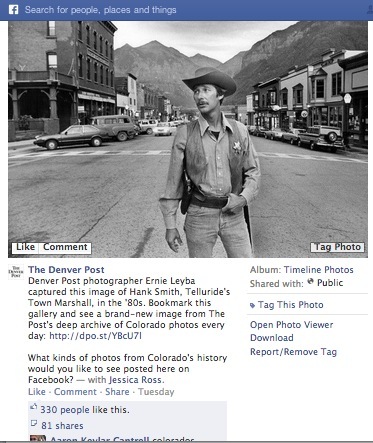 This much is clear: Remember-when photos are an effective engagement tool. Please let me know how your newsroom is using them and what works well (or doesn’t work) for you. We started compiling archival slideshows at MercuryNews.com last summer, and now have a collection of them. The favorite so far, on the defunct amusement park Frontier Village, has gotten about 26,000 page views. Beauty queens; bars, taverns and discos; and cheerleaders and twirlers have each gotten 12,000-15,000 so far. The slideshows have an article template that displays links to the previous collections. In a month or so we’ll be adding favorite “remember when” stories to the section. I don’t think they’ve been getting much play on Facebook. We do have a Pinterest board for the archival photos, though, and we’ve been tweeting them out. That’s Halle Berry at age 20 in a Miss World pageant from the Merc’s Archive Photos Pinboard. @stevebuttry Great blog post. 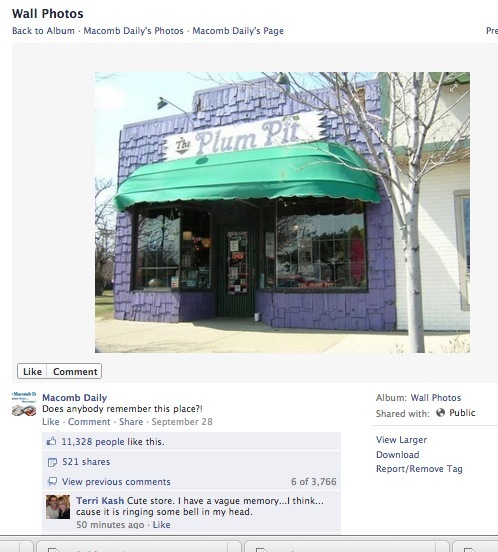 At @ledgerenquirer, we use remember-when photos for “Throwback Thursday” trivia on Facebook. With Twitter archives now available, how would you use old tweets? Twitter has made your archive of old tweets available. For the fun (or embarrassment) of reviewing your first tweet and other early tweets or to find tweets from your early coverage of a story that’s back in the news, you should acquire and check out your Twitter archive. Shea Bennett and Buffy Andrews give detailed instructions with illustrations, which I won’t repeat in detail here. Basically, you go to your Twitter settings, click the “request your archive” button and Twitter emails you a link to download the archive as a zip file. The zip file includes an html file where you can view the files and a csv file where you can get them in a spreadsheet. My Digital First colleague Ivan Lajara immediately started Storifying first tweets as we started confessing them. Hashtags sharing first tweets included #myfirsttweet and #firsttweets (did you notice or use any others?). As Mandy Jenkins suggested in a Google Group discussion yesterday, this would make a good local engagement project, asking people in your community to share their first tweets and Storifying them. You could choose some finalists and have the community vote for best first tweet, most embarrassing first tweet, etc. That’s fun, and if you’re doing something like that in your community, please share some links and descriptions here. By the way, I beat Mandy onto Twitter (by three days), but she beat me at examining her archive to note some personal and professional milestones that she had tweeted. If you’ve blogged, Storified or otherwise curated your early tweets (or seen such a compilation from someone else), please share those links. I’m going to explore my old tweets and will probably do a couple of self-indulgent memory-lane blog posts (travel tweets for sure) in the next few weeks. But here’s my question for you (I’ll try to think of my own answers): What are some uses you might make of the Twitter archive, other than nostalgia or fun? I was busy during the fuss over the Journal News publishing (and eventually unpublishing) a map of gun permit holders in its coverage area. Other than a few comments on social media, I didn’t join the discussion. While I thought some criticism was valid, I was troubled by the outcry among journalists. At several points, I wanted to weigh in, but I couldn’t figure out exactly what I wanted to say. So I kept mostly silent and kept my focus on the work I needed to do. Geneva Overholser (a colleague from our first hitches at the Des Moines Register back in the 1980s) has said what I wanted to say. Whether you agree or disagree with the publication of the gun permit data, you should read Geneva’s Online Journalism Review post Secrecy is trumping public interest in gun control coverage. From local sheriffs and gun owners intimidating publishers about concealed weapon permits that are and should be public records to an increasingly opaque White House, momentum is shifting away from openness. Journalists and citizens should worry about that shift, however you feel about a particular issue. We need to make the case for openness better than we have. I’m glad Geneva made the case well, and I’m sorry that I didn’t. What are some other helpful career-oriented links for journalists? Let’s have some fun with March engagement projects. My Valentine’s engagement contest resulted in 10 great engagement ideas. I’d love to get enough ideas for March engagement to use some kind of bracket in the contest. Tell me about your newsroom’s March engagement project. 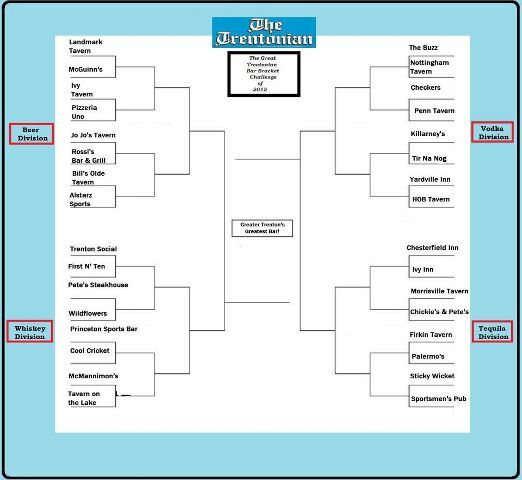 It can be something related to the NCAA’s March Madness basketball tournament (as the Trentonian did last year in its best-bar bracket, shown above). You can do something relating to the start of spring or to St. Patrick’s Day. Your project can involve engagement around the March religious holidays: Lent, Easter, Passover or another holiday that’s important in your community. Or maybe you’ll engage around something else such as a community event. What you need to do is use this entry form to tell me about your project (including a link). The engagement project doesn’t need to be finished to join the contest, but you do need to have announced it. The deadline for entries is March 11. I will launch the contest with a blog post the following day (a week before the start of the NCAA tournament). The entry form invites your suggestions for how the contest will run. I’d like to involve a bracket in some way. And I’m open to a two-phase tournament, weeding the field to some finalists (and allowing the finalists to provide updates on how their projects are going) for a second phase of voting. The Valentine’s contests this year and last were limited to my blog. But we’re running this contest on both my blog and Inside Thunderdome (where you can regularly find weekly live chats with leading journalists, spotlight features on Digital First Media journalism, our monthly DFMie winners and other news about our company). A final point: That entry form was really easy to make using Google Forms. If you’re not using them as an engagement tool, you might consider how to use them in your engagement project. They’re simple to use. Go to Google Drive (formerly Google Docs), click “create” and choose “form” from the options. From there, the options are pretty self-explanatory. You click Send Form to get the link to share. Or you can just click “view live form” and send that link. You can view the responses by clicking “responses” (one of the options is to create a spreadsheet for your responses, which I did).